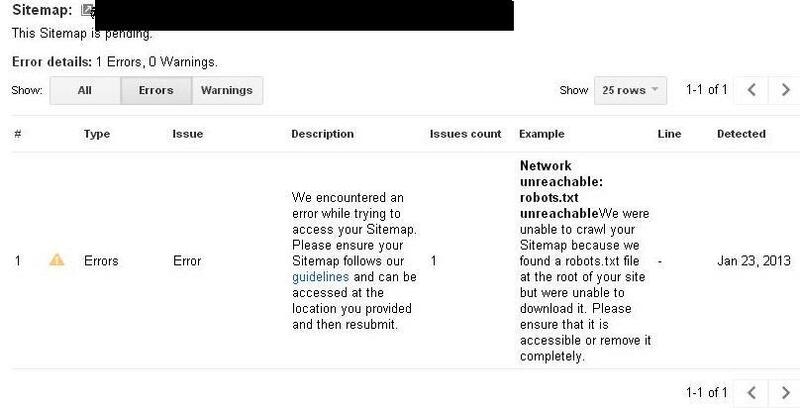 "Network unreachable: robots.txt unreachable.We were unable to crawl your Sitemap because we found a robots.txt file at the root of your site but were unable to download it. Please ensure that it is accessible or remove it completely." The error message above usually occurred while submitting your sitemap file to Google's webmaster tool and this happens for several reasons. Second reason why you're getting the unreachable network error is you don't have any robot text file in your site root. The robots.txt file is the way your site tell search robots which pages you would like them to visit or not to visit.Its not mandatory for search engines but generally search engines obey what they are asked not to do.Robots file can be setup also as a protection againts thieves accessing your private files or pages. Save it as robots.txt file and upload to your site root.Now try submitting you sitemap again. Third, the last issue is probably in your web hosting provider.Inform your web host to allow Google bot to access your site and this eventually works like a spell. If you still had encounter the problem don't hesitate to put a feedback below and I'll try to help you.